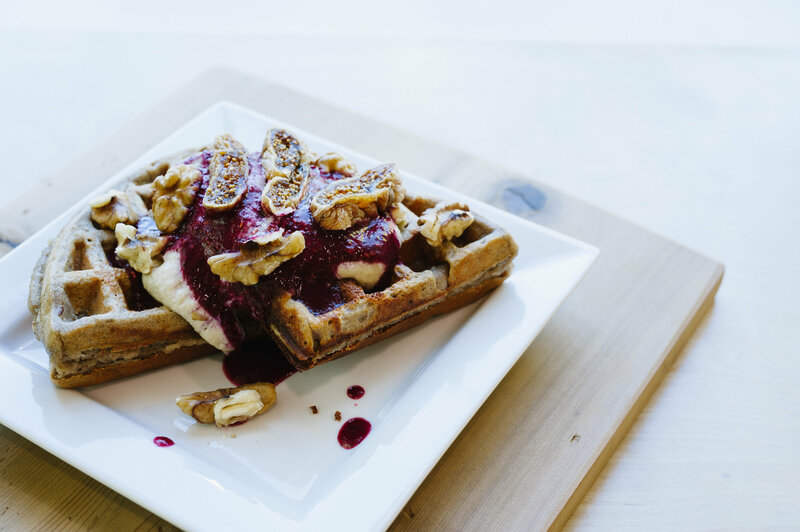 Whistler is best known for skiing and snowboarding, but this little resort town has recently seen an explosion of vegan options in local restaurants and now has more tasty and creative vegan eats than you can shake a ski pole at. With millions of international visitors year round, Whistler may well be on the map as a vegan foodie destination in the near future too. 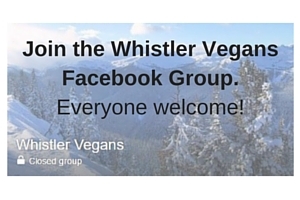 For the last few years we’ve asked the Whistler Vegans Facebook Group to vote on their favourites for vegan options in Whistler. This year the list was enormous! Here’s how the locals voted, and we’ve shared some of our favourites below. The crème de la cashew crème of vegan dining in Whistler is Alta Bistro. Working hard in the kitchen of this French Bistro is vegan Chef Ed Tatton, who ensures that there are exquisite vegan options available for every course. With a menu that changes seasonally, Tatton skillfully reworks classic dishes, giving them a plant-based twist. Diners will be delighted with a feast for the eyes and palate, and in the past the menu has featured dishes such as Marinated Portobello Mushroom Burger with garlic aioli and beet ketchup; Crispy Spiced Cauliflower with pickled walnut salsa; and Frozen Almond Butter Parfait with smoky amaretto. A must visit for all vegans in Whistler! The Green Moustache Organic Café is Whistler’s only 100% vegan eatery, with 2 locations to choose from in Whistler, as well as a vegan vending machine! Start your day with the tasty Banana Buckwheat Waffles with figs, cashew crème and chia jam. Return for lunch and order something that comes with their insanely good Liquid Gold Dressing. And if you’ve still room in your belly after all that then be sure to enjoy a decadent dessert such as their melt-in-your-mouth Chocolate Avocado Tart or any flavour of house-made vegan cheesecakes and raw desserts. When it comes to Japanese food it can be hard to avoid hidden fish stock, but that’s not the case at Harajuku and sister restaurant Ohyama Ramen. Harajuku/Ohyama has wowed vegans with their extensive range of delicious vegan options. The creamy vegan ramen with tofu, shiitake mushrooms, onion chips and kale noodles is a must-have dish for vegans and non-vegans alike. Harajuku also shares the vegan love with their Rock’n’Roll vegan sushi, Green Bowl, vegan spring rolls, roasted Brussels sprouts, Agedashi tofu, Crunchy Tofu Salad and more. Come hungry! Just opened this fall, the Velvet Underground Café has been setting a new standard for vegan comfort food in Whistler, showing how it’s done with delicious vegan items that have included a Tofurkey sandwich complete with roast potatoes and mushroom gravy! They have daily muffins and other treats, as well as soups, smoothie bowls, sandwiches, samosas and the incredible Hip Pocket Pies. They are also a vintage clothing store so you can do some shopping while you’re there. One of the first on-mountain vegetarian restaurants in the world, Raven’s Nest offers vegan comfort food paired with breathtaking views. Give your taste buds a treat with the hearty vegan Meatball Sub or Pulled Pork Jackfruit Sandwich, fuel up for the afternoon with vegan pasta topped with Daiya cheese, or choose from a range of soups, stews and salads with garlic bread. And be sure to indulge in the warm vegan brownie for dessert. Proud participant in Whistler’s 2016 Vegan Dessert Challenge, The Cure Lounge at Nita Lake Lodge recently added an entirely vegan 3 course Meatless Monday menu that has included dishes such as Butternut Squash Farro Risotto; Warm Sticky Toffee Pudding with maple cashew crème and berries; and Spiced Ice Cream Sundae with caramelised bananas, candied pecans and toasted coconut. Sister restaurant Aura also features several vegan options including Vegan Potato Hash and Blueberry Pancakes. Spoil yourself with an incredible brunch, lunch or dinner on the gorgeous lake view patio. New to Whistler, Fifi’s Bistro has already won gold in the hearts of local vegans. Out of the gate they were committed to having flavour-packed vegan options on the menu such as the Roasted Cauliflower Sandwich with kale & apple slaw and toasted ciabatta; Ratatouille Stuffed Peppers with Thai basil and farro; and Kabocha Squash & Wheat Berry with compressed apple, kale, salsify, sunchoke, ginger and onion jus. Show your appreciation by ordering their delicious vegan cheesecake for dessert (any excuse for dessert, right?!). What better way to finish off your skiing, biking or hiking adventures than relaxing on a sun-drenched patio with a cold beer or cocktail, a lip-smackingly good vegan meal and glorious mountain views? You’ll find all these things and more at the Garibaldi Lift Company (GLC), located at the foot of Whistler mountain. Watch the skiers or bikers speeding by while enjoying a protein-packed vegan tempeh burger with Indonesian slaw and lime togarashi vegan mayo; the Grilled Tempeh Caesar Salad with crispy capers and herb focaccia croutons; or the Signature Superfood Salad or Kale Salad packed full of all that good stuff your body loves. Tandoori Grill has many long-term loyal vegan customers as they were catering to vegans well before it became trendy, with traditional Indian dishes such as Channa Masala, Mushroom Matar and Vegetable Jalfrezie. The owner is vegetarian and welcomes vegans though as they were his own family members. If you’re lucky he may even offer some vegan dishes that aren’t on the menu, such as a freshly made okra curry. Order a selection of vegan items from the menu and make sure one of them is the Eggplant Bharta. When it’s cold outside nothing beats vegan comfort food in a cozy café for getting warm and snug. Drop by Gone Eatery for breakfast and enjoy satiating oatmeal topped with candied nuts and mixed berries or banana, or feast on the highly recommended Vegan Classic with baked beans, potatoes, kale, tomato, toast and avocado. For lunch choose from the Vegan Pad Thai with rice noodles, tofu, veggies, peanuts, sprouts and cilantro or the Vegan Bowl with quinoa, beans, corn, edamame salsa, sesame Thai dressing and candied nuts. And while you’re there, remember to grab a vegan muffin for later! Home to another of Whistler’s amazing vegan chefs, Chef Mike Quigley, Olives Community Market will leave you spoilt for choice when it comes to a quick lunch or mouth-watering vegan baked goods. Vegan wraps and salads can be found in their to go fridge and their hot bar always features several tantalizing vegan options. The bakery section features vegan cookies, banana bread, muffins, vegan cheesecake and more. Be sure to try their delectable vegan cinnamon buns, as well as their vegan Twix and Snickers bars! You can find more details of each location in our restaurant listings. New vegan options are being added all the time, such as the incredible vegan pizzas at the new Functional Pie Pizzeria…which we are sure would have been voted on in the poll but they only just opened!